Design and Healthcare: How do you get started? The 2018 Australian Telehealth Conference in Sydney wrapped up recently, and the conference theme of ‘Transforming Care, Virtual, Connected & Co-Designed’ meant that the topics of design thinking and co-design were on people’s minds throughout the two days. One of the challenges noted during the conference was that it is difficult for people to know how to do design properly. As Professor Jane Burns put it in her keynote speech, the challenge now with eHealth – and telehealth solutions in particular – is not with the intent behind innovations, but with their implementation. Simply, existing solutions are not always fit-for-purpose and the roll-out of these systems often fail to give enough consideration to the social and organisational contexts in which they’ll be used. In other words, eHealth solutions often fail because they haven’t been designed with and for the people that will be using them. Many speakers noted that this was not due to deliberate neglect on behalf of product vendors or project teams – rather, it was mostly because people don’t know how to start co-designing their solutions. With that in mind, the aim of this post is to provide a real world example of how a design-led approach was applied to the implementation of a new telehealth solution. In 2017, Paper Giant was asked by our client, a major provider of telehealth in Australia, to investigate the potential for telehealth solutions to reduce social isolation in aged care consumers. We were asked to uncover insights into the needs and behaviours of these consumers so that our client could make more informed decisions about how to reduce social isolation – through technology investments, or otherwise. And so our project started with the question – What are the factors that lead to social isolation in aged care consumers, and how might technology help? 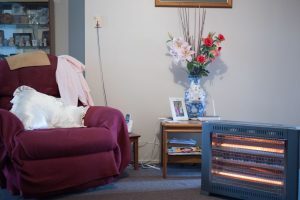 A participant’s lounge room. Image: Reuben Stanton. The first step in the design process was to speak to consumers. We worked with the care provider to identify a number of their existing consumers who they thought might benefit from new solutions. We visited each of these people in their homes, and asked them to tell us about their social life, their care, and the ways in which they did or didn’t manage to stay in touch with family, friends and their communities. In total, we interviewed seven participants. These semi-structured interviews allowed us, as researchers, to be guided by our participants lived experiences rather than our own pre-determined assumptions around what was or wasn’t important to them. It was important to conduct this research in the context of participant’s homes. By doing this, our participants were able to show us the ways they already kept track of social and medical appointments (like wall calendars), and how and where they used the technologies they already had in their home. This approach allowed us to gather rich ethnographic data – focusing on the why and how, as well as the what. This data was different to what we might have gotten through more quantitative methods, like a survey, because we got to dig into the reasons for why. The reasons why a wall calendar was important, and the reasons they called their sons and daughters for technology support, were just as important as knowing whether they did these things or not. When it comes to design, the why’s and how’s are often the most telling. We found that contexts of use of technology vary very widely. Some elderly patients were very computer savvy – they used iPhones, facebook, and did digital courses online. Some disabled patients couldn’t use a computer at all without assistance. Some patients were effectively ‘trapped’ in their home, where the only people they saw were carers and delivery drivers, and the only ‘digital’ contact they made was through playing online poker. Some patients were wheelchair bound but had an incredibly active social life in the community. We found that the patients most interested or likely to be engaged with the digital solution already had the most active personal and online social networks, and the most connections to the community already. The biggest determinant in whether people had good access to technology – computers, phones, iPads, wifi – was whether they already had a strong support network; friends and family. The most isolated were the least likely to be able to use technology. Often, they didn’t even have wifi. Our client’s identified solution was a great piece of technology to look at and use. Unfortunately, the patients most likely to need it were the same ones least likely to have the means or capacity to use it. 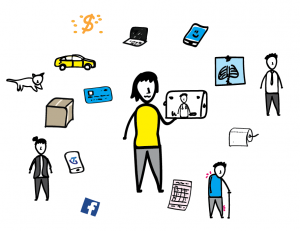 User Research gave us the methods for understanding the ways that social technologies fit into complex lives. Despite these barriers, we did find there would be value in social technologies for certain consumers. After conducting our research, we made a number of recommendations to the care provider. Very few of them were about the design of the technology itself – but rather ways that the technology could be made more meaningful and useful to their consumers. auto-enrol consumers into digital groups with other consumers they were already likely to know (for example, creating groups for people that visited the provider’s respite centre on certain days). organise ‘virtual activities’ run by staff that clients can sign up for, taking inspiration from existing activities run by the provider in their respite centre. Connect clients across different geographic regions based on areas of interest instead of geography, because our participants told us that living near someone didn’t necessarily mean you had anything in common with them. Create a volunteer matching program, so that more tech-savvy consumers could help those that weren’t. These ideas all came out of our qualitative research – none of them had been considered beforehand. Each of them were potentially more important to clients than the ‘feature set’ and ‘functionality’ of the telehealth solution. Indeed, our participants didn’t care so much about the technology – they cared about staying connected to existing networks, being supported doing what they already loved, and being able to help others. How do you start? User research! We hope that this case study provides a practical example of how qualitative user research, as the first step in a new telehealth project implementation, gave us practical and valuable insights into the social factors likely to determine the project’s success. It is important to note that this entire project, including stakeholder consultation and the user research itself, was completed in a little under two weeks. Conducting research with a relatively small number of participants, in a short time frame, helped the project team understand the problem they cared about – social isolation in aged care consumers – in a richer way, so that their project could better respond to the community it hoped to serve. With our client, we were able to help understand the factors that would lead to the success of their telehealth project – and most of those were social. Dr Chris Marmo is the co-founder and Research Director of Paper Giant, a strategic design agency with a passionate interest in healthcare.